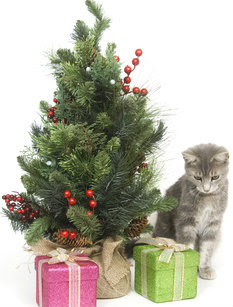 The Daily Cat: Is Christmas Shopping Going To The Dogs? Dog beds were the most common search, edging out collars and even toys. But while dogs might sleep the holidays away, cats will be up and running. Most of the people shopping for cats were looking for toys and scratching items. Maybe because dog beds can be expensive, searches that included the word "sale" were 16 percent more common among dog owners than they were among people who were looking for gifts for cats. If you're still looking for gift ideas for your cats, these are the top 10 best sellers on Amazon. Fashion's Talk Cat Toys Variety Pack : A collection of catnip toys, balls and a wand toy. SmartyKat Skitter Critters Catnip Mice : Three mice come in one package. KONG Naturals Crinkle Cat Toy : Two fish make a crinkly sound and have long feather tails. Cat Charmer : A long piece of fabric for kitty to chase is attached to the wand of this popular toy. KONG Cat Cozie Kickeroo : This is an 8.5" long catnip kicker made from plush fabric. Catit Designs Play Circuit : The Play Circuit has almost 4,000 reviews on Amazon! SmartyKat Feather Whirl : This electronic toy looks like fun if your cat likes feathers. PETFAVORITES Original Mylar Crinkle Balls : Most cats love Mylar crinkle balls, but these may not be the best choice. Read the reviews before you buy. I have to admit I'm one of those millions of Amazon Christmas shoppers. That's where I find the most interesting gifts for my cats. They love Hot Cats , and I can't find them locally. No matter what your cats love to play with, here are some things to keep in mind when you're Christmas shopping for cats. Make sure the toys are big enough for adult cats. Many toys, especially the bat and swat toys that you put on the floor for the cats to play with themselves, are designed for kittens, not adults. Cats don't care whether their play mice have eyes and bells, and sewn-on eyes and bells can be a choking hazard. Look for toys that are durable and well-made. There's nothing more frustrating than catching a "mouse" and having it fall apart at the seams. Avoid toys that are filled with nutshells, beans or polystyrene beads. These, too, could be a choking hazard if the toy falls apart. And here's one more holiday tip. 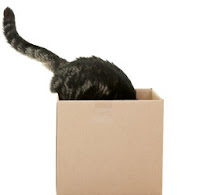 Save those cartons your online purchases come in for your cats. A big box with crunchy packing paper inside could be the best Christmas gift of all for a cat!